Crowd-Pleasing Variety Entertainment. 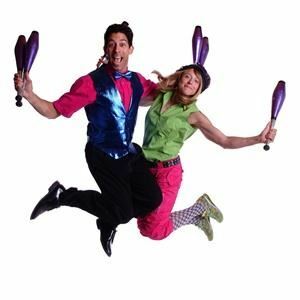 This award-winning, dynamic duo will amaze you with continuous feats of team juggling, partner acrobatics, and a variety of other odd skills (like synchronized flowerpot manipulation). They'll also keep you laughing. Jack & Jeri's teamwork will inspire and delight any audience. *** Clean comedy without insult or embarrassment! *** Engage the audience and keep them laughing! *** Seemingly impossible feats of dexterity!